The Royal Commission into Institutional Child Sexual Abuse held its first hearing on 3 April 2013. Justice McClellan AM, the chair for the Royal Commission, acknowledged that there had been harm committed against children which has caused lasting damage. He recognised that to enable the community to move forward, there is a need to understand where wrongs have occurred and, as much as possible, to right those wrongs. 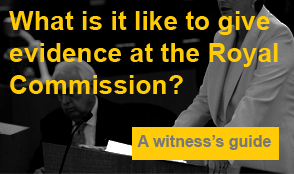 The Royal Commission, where appropriate, will be conducting hearings in public. However, some information and evidence will remain confidential to the Commission. There will be those who, for various reasons, do not wish to have their hearing conducted publicly. In these cases, the Commission will allow for a private session which will generally involve a meeting between the individual and one or two Commissioners. The individual may have one support person present with them but representatives of the institution or person about whom they wish to speak will not be present. The Commission will travel to various parts of Australia to facilitate the gathering of evidence. It is expected that these sessions will take place in hotel and motel function rooms and will take about an hour. The information given at a private session will be kept confidential by the Royal Commission; unless the person providing it agrees to it being disclosed or if Justice McClellan, as the Chair of the Royal Commission, believes that it is necessary to disclose information only to a law enforcement agency and only to prevent harm to any person. Justice McClellan assured the public that the Royal Commission has powers to overcome confidentiality clauses that a person might have entered into prior to the Royal Commission. Anyone who has signed a confidentiality agreement should advise a member of the Commission’s staff when they first make contact and before telling their story so that the appropriate procedure can be undertaken. The Royal Commission expects that many institutions will cooperate and waive reliance on such a clause. The Commission is inviting people who wish to tell of their experiences of child sexual abuse in an institution to call 1800 099 340 between the hours of 8 am and 8 pm. You will be asked for your contact details, the name of the institution you wish to speak about and an indication as to when the events occurred (although the Commission realises it may be difficult to recall precise dates). The Commission would also like to know whether you have any special needs that will need to be taken into account such as the need for an interpreter or any disability that might need special access or requirements.